Matthew Turley advises clients on a wide range of health care matters. With experience that includes legal research, drafting pleadings and motions and client counseling, Matt is involved in all phases of litigation. He is committed to partnering with his clients to ensure they are informed throughout the process and find a solution that keeps their best interests in mind. Prior to joining Hinshaw, Matt was a research assistant to Professor Sarah Fox of Northern Illinois University College of Law. In that capacity, he compiled and analyzed data on issues related to environmental law and affordable housing. As a summer associate for a firm in Rockford, Illinois, Matt performed legal research on a wide range of topics including civil rights and workers' compensation issues. 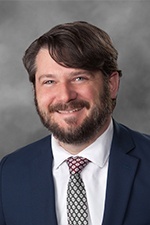 He also worked as a student attorney under Illinois Rule 711 with the Zeke Giorgi Legal Clinic, representing low income individuals in Order of Protection proceedings and drafting estate planning documents. Additionally, Matt was an intern for the 17th Judicial Circuit Court of Illinois where he assisted with "Justice for Families" grant projects, including the development of language access resources.